Did you know stainless steel dates back to the early 1800s? Today, different kinds of stainless steel in various grades and finishes are used in thousands of products, some familiar, some not so. Domestic, architectural, transport, medical, and food and drink industries use stainless steel for many different purposes, but why is it so popular? In the catering business, you will already be aware that steel has many uses such as cutlery, saucepans, catering equipment, sinks, microwave oven liners, brewing and distilling apparatus. 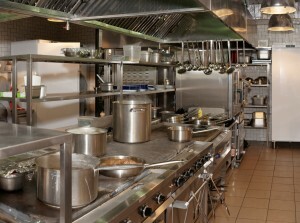 Why choose stainless steel in your kitchen? Did you know steel is the most recycled material in the world? It may also be one of the most environmentally friendly metals to produce. According to the American Iron and Steel Institute, approximately 88% of the world’s steel is recycled. At the end of its life, up to 92% of stainless steel can be reused and is put back into new stainless or carbon steel. Speak to your local council about what you can recycle and how to do it in your area, or check here. Q: Did you know stainless steel can neutralise smelly hands when you’ve been preparing food? Have you heard of stainless steel soap? Would you believe that when you touch stainless steel, the molecules in the steel bind with the sulphur molecules on your hands? They then transfer the molecules (including the smell) off your hands and onto the metal. We’ve tried and tested this and can guarantee it works on strong odours such as garlic, onion and fish. Once wet, try rubbing your fingers and hands on your stainless steel sink at home or in the kitchen at work and see/sniff for yourself! Q: Did you know many famous buildings have been made from stainless steel? The iconic outer of the Chrysler Building in New York, structural support for the striking Statue of Liberty and restoration of the historic Palm House at Kew Gardens in London was all done using stainless steel. Q: Did you know you can wear stainless steel? Stainless steel is very ductile, which means it can be made into thin wire to weave with, without losing any of its strength. Stainless steel clothing is thermal and resistant to radiation, so is ideal for both the textile and electrical industries. It’s often used in touchscreen gloves and can even be used in carpets to reduce static electricity! We hope you’ve learnt something new from this blog and understand why we think stainless steel is such an important part of the catering business. Whether it’s commercial kitchen design you’re after, or more appliances and equipment, talk to us about the selection of stainless steel options we have available at Caterline.